Home » Website Building » WordPress » How to Add Audio Player in WordPress Site Without Plugin? How to Add Audio Player in WordPress Site Without Plugin? WordPress has an integrated HTML5 audio player to showcase your audio files in simple manner. You can either create a player with single audio or with multiple audios as a playlist. In this article we will explain how to add audio player in WordPress site using default audio shortcode. WordPress has a built-in audio shortcode for inserting a HTML5 audio player in your posts, pages and widgets. It supports all HTML5 supported file types like .mp3, .egg and .wav. Similar to any other images and videos, upload your audio file through “Add Media” button in WordPress post editor. After the file is uploaded, enter the track details on the media screen. 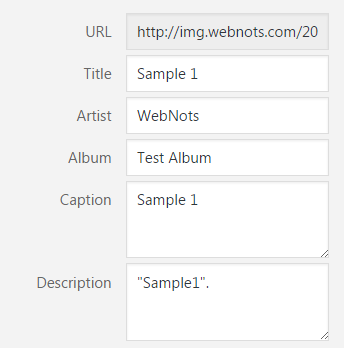 WordPress allows you to add track details like title of your audio, artist name, album name, caption and description for your audio file as shown below. Though single file audio player does not use these details on the screen, these details are shown in the playlist. Scroll down to the end of the pane, and check you have selected “Embed Media Player” option. It should be selected from the dropdown against “Embed or Link” under “Attachment Display Settings” section. This is an important setting allows WordPress to insert audio player instead of linking to the media file or to the attachment page. Click on the “Insert into post” button to add the file into your WordPress post. WordPress will automatically add HTML5 audio player. Below is an example of default HTML5 audio player inserted using audio shortcode. The audio player has minimum controls with play / pause buttons, progress bar showing time duration, volume control and volume bar. The default audio player is responsive and occupy the available width based on the browser’s width. And the published article will have the same audio player as you see inside the post editor. Now click on the “Text” tab in the editor to see the audio file basically uses a shortcode to display as a player. We have added a space before and after the square brackets to avoid the text is being converted into an audio player. When using shortcode you should remove those spaces to work properly. The closing audio tag is not mandatory. You can also add the fallback audio files using the below shortcode. In this case if there is a problem in playing .mp3 file then WordPress will choose the fallback option .ogg and then .wav. Ensure to enable autoplay option only if required in order to provide good user experience. Click on the “Add Media” button in your post editor and then click on the “Create Audio Playlist” option. Upload or select the required audio files to be shown in the playlist and click on “Create a new playlist” button. You will be taken to the edit playlist screen as shown below. Drag and drop the files to reorder the playing sequence and change the captions if required. Under “Playlist Settings” pane on the right side, enable or disable track list, artist name and featured images to be shown in the audio player or not. In order to add featured image for audio files, navigate to “Media > Library” menu. Edit the audio files you have uploaded and add featured image to each audio file. type audio video Change audio player to video player (you need to have a required videos uploaded). The purpose of using shortcode is very simple – it can be inserted into any area of your site like sidebar and footer. Under “Appearance > Widgets” drag and drop the “Text” widget on the sidebar or footer area where you want to add the player. Insert the audio or playlist shortcodes with your customization as explained above. Save your widget and the player will be shown on the selected widget area.